The medial epicondyle of the humerus is an epicondyle of the humerus bone of the upper arm in humans. It is larger and more prominent than the lateral epicondyle and is directed slightly more posteriorly in the anatomical position. In birds, where the arm is somewhat rotated compared to other tetrapods, it is called the ventral epicondyle of the humerus. In comparative anatomy, the more neutral term entepicondyle is used. The medial epicondyle gives attachment to the ulnar collateral ligament of elbow joint, to the pronator teres, and to a common tendon of origin (the common flexor tendon) of some of the flexor muscles of the forearm: the flexor carpi radialis, the flexor carpi ulnaris, the flexor digitorum superficialis, and the palmaris longus. The ulnar nerve runs in a groove on the back of this epicondyle. The medial epicondyle protects the ulnar nerve. The ulnar nerve is vulnerable because it passes close to the surface along the back of the bone. Striking the medial epicondyle causes a tingling sensation in the ulnar nerve. This response is known as striking the “funny bone”. The name funny bone could be from a play on the words humorous and humerus, the bone on which the medial epicondyle is located. 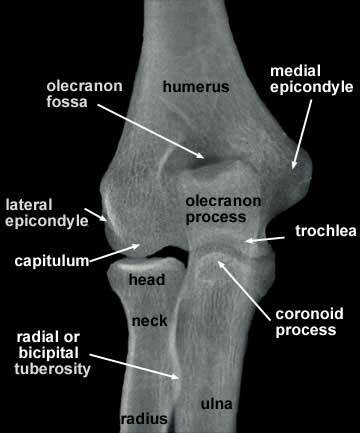 The medial epicondyle is located on the distal end of the humerus. Additionally, the medial epicondyle is inferior to the medial supracondylar ridge. It is also proximal to the olecranon fossa. ^ Saladin, Kenneth S. Anatomy & Physiology: The Unity of Form and Function. McGraw-Hill Publishing Co. ISBN 978-0071316385. This page was last edited on 27 November 2018, at 16:51 (UTC).